Edward St John Daniel was born in Bristol, England on 17th January 1837, the eldest child of a respected local attorney. Through his mother's line he was distantly related to Henry Tudor, King Henry VII. Daniel's mother died when Edward, known to the family as "St John" (pronounced sinjon) was barely thirteen. Just before his fourteenth birthday, Daniel enrolled as a Cadet in the Royal Navy. As a Midshipman, and Aide-de-camp to the celebrated Capt. 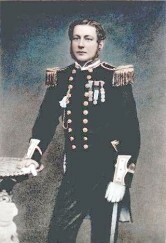 William Peel of HMS Diamond, Daniel won the Victoria Cross in the Crimean War (1853-1856), for three separate acts of bravery at Inkerman and Sebastopol, when he was aged just seventeen. 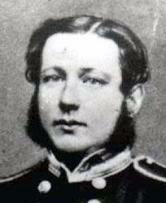 Daniel was the youngest recipient of the VC when the first awards were made in 1857. Daniel later served with distinction with the famous "Shannon's Brigade" under Capt. Peel in the Indian Mutiny campaign of 1857-1858. Peel was shot and contracted smallpox while recovering from his wounds. He died in April 1858, aged 33. Peel's death is believed to have had a devastating effect on young Daniel. Daniel was promoted to Lieutenant in 1859. In April 1860, he was presented to Queen Victoria at St James's Palace. The Queen is said to have been "much impressed" with him. However, the following month, Daniel was severely reprimanded for being absent without leave and, in June 1860, he faced a court martial after being found drunk on duty. On 25th June 1861, while on service in the Mediterranean, Daniel was arrested and was due to be again court-martialed for an offence that was "disgraceful" but unspecified. However, the following evening, Daniel was found to be missing from the ship at Corfu. He was designated a deserter and, in July 1861, his name was removed from the Navy List. On 4th September 1861, Queen Victoria signed a Royal Warrant that made Edward St John Daniel the first man to be stripped of the Victoria Cross. Since that time only seven other recipients have forfeited the VC and, of these, Daniel remains the only officer and the only Royal Navy man. The last forfeiture was in 1908. Daniel somehow made his way back to England and, on 16th September 1861, he was at Liverpool aboard a clipper bound for Melbourne, Australia. The ship arrived in December that year and Daniel is believed to have then found work as a miner in the Gold Fields around Melbourne. In January 1864, Daniel signed up at Melbourne for three years service as a Private with the Taranaki Military Settlers who were at that time engaged in the Maori Wars. Daniel arrived in New Zealand in February 1864 and, over the next three years, his company took part in many operations against the Maoris in South Taranaki. In August 1864, Daniel was arrested and sentenced to 168 hours intensive labour for an unspecified offence. Later that month he was arrested again, court-martialed, and confined for a two-week period. No other offences have come to light during Daniel's time with the Taranaki Military Settlers. In May 1867, the Taranaki Military Settlers were disbanded after a temporary peace in the Maori Wars. It is uncertain whether Daniel received the grant of land to which he was entitled from his service with the Military Settlers. In November 1867, Daniel enlisted as a Constable in the NZ Armed Constabulary. In March 1868, 70 members of Daniel's Division were sent to Hokitika, South Island, after disturbances had broken out in the West Canterbury Goldfields between the Irish Protestant and Catholic communities. These disturbances were soon quelled, but half the Constabulary force, including Daniel, remained at Hokitika. On 16th May 1868, Daniel, who is reported to have been ill for some time, was admitted to Hokitika Hospital where he died four days later, aged 31. The cause of death is recorded as "delirium tremens". The next day, 21st May 1868, Edward St John Daniel was given a full military funeral at Hokitika. He is buried in a recorded but unmarked grave at Hokitika Cemetery. VC researcher Victor Tambling has suggested that Edward St John Daniel may not have died in 1868, and may not be the man buried at Hokitika. Tambling's theory is that some time during his time in New Zealand, probably while, or shortly after, serving with the Taranaki Military Settlers, Daniel switched identities with another man, in order that he might then return to England. As Daniel was still recorded as a deserter by the Admiralty, he might reasonably have feared being rearrested. Tambling's evidence for this theory is largely based on a "cabinet photograph" in his possession showing a middle-aged man, purportedly Edward St John Daniel, which was taken in London sometime after 1865, when Daniel is presumed to have been in New Zealand. The same image is also found in the Imperial War Museum and National Army Museum files on Edward St John Daniel, which were originally collated by leading VC researcher, the late Canon William Lummis. 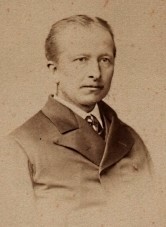 Canon Lummis had himself obtained a copy of this cabinet photograph prior to 1956, before the photograph (c. 1860) showing Edward St John Daniel in full uniform was discovered. Certainly the two photographs show a striking resemblance, and a leading forensic pathologist has declared himself "quite convinced" that the two images show "one and the same person". Another indication that there may be some truth in Tambling's theory comes from the American writer Jack London who, in 1902, toured the slums and workhouses in the East End of London. His 1903 book "The People of the Abyss", which recounts his experiences at the time, includes a chapter entitled "A Winner of the Victoria Cross". In this chapter, Jack London descibes meeting an elderly man whose story has uncanny parallels with that of Edward St John Daniel, including joining the Navy, serving in the Crimea and Indian Mutiny, and winning, and later being stripped of, the Victoria Cross. Sometime after 4th September 1861, when the Royal Warrant of forfeiture was issued, Edward St John Daniel's Victoria Cross medal was returned to the Admiralty. In 1868, the Cross was loaned by the Admiralty to a collector of military medals, and subsequently it came into the possession of Major-General Lord Cheylesmore. On Cheylesmore's death, the medal was sold at auction in 1930 for £40. The medal has since sold at auction on several occasions. The last sale, in 1990, realised £19,800. Daniel's VC medal is now part of the Victoria Cross collection of Lord Ashcroft, which is on permanent display at the Imperial War Museum, London. 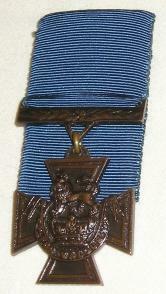 The Victoria Cross Warrants have always included a provision for the restoration of forfeited awards. In June 1981, Mr Norman Turnbull of New Zealand sent a petition to H.M. Queen Elizabeth requesting a pardon and restoration to the Victoria Cross Registry for Edward St John Daniel who, he argued, was a victim of alcoholism. In September that year, Mr Turnbull received a reply from the Official Secretary to the NZ Governor-General stating that any petition for restoration must come from the recipient of the award himself. Furthermore, it was "considered inappropriate to reverse the decision made in 1861 by Queen Victoria". None of the eight forfeited Victoria Cross awards has been officially restored.